For Gary Moore, the safety of the world outside his lab matters just as much as the people inside. An assistant professor in Arizona State University's School of Molecular Sciences, Moore develops chemicals and nanoscale materials using solar energy and other novel, green methods. For these artificial processes, he draws inspiration from the biological mechanisms that convert and store energy in nature. 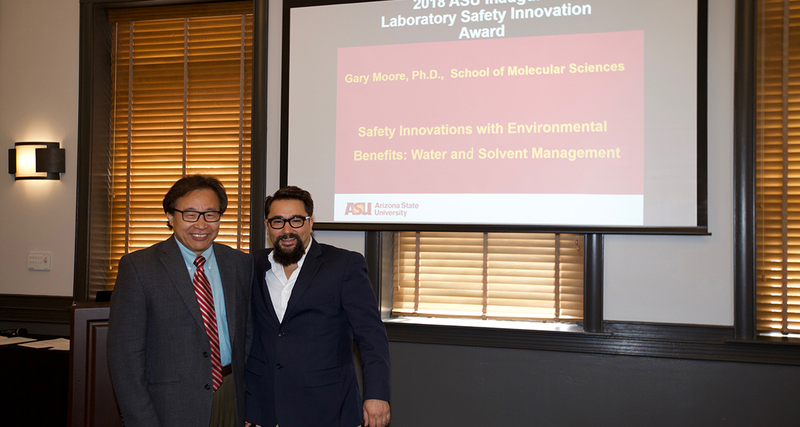 On April 10, Moore was awarded the 2018 Laboratory Safety Innovation Award to honor his innovations in safe science at the Tempe campus’ University Club. This was the inaugural year for the award, sponsored by ASU’s Laboratory Safety Committee in partnership with the office of Knowledge Enterprise Development and Environmental Health and Safety. The award was designed to highlight ASU’s dedication to safe science, recognizing a principal investigator for implementing an innovative safety program in an ASU research lab. Moore’s lab was chosen for rising above and beyond green certification standards, incorporating technologies that both conserve resources and reduce flood and fire hazards. “The consequences of destructive environmental practices reach beyond the local community, threatening the health and well-being of all those outside ASU,” Moore said. Unfortunately, while the Arizona heat dries up our desert communities for another summer, many laboratories will still need tens of gallons of water a day just to operate their equipment. According to Moore, the single-pass cooling systems typically used to cool autoclaves, icemaker condensers and other lab equipment are especially prone to flooding. Regularly, these systems use enough water to do 40 loads of laundry a day — flooding can waste hundreds of gallons on top of that. If the water mixes with water-intolerable chemicals, the floods can also ignite fires. To replace these single-pass cooling systems, Moore has installed four water recirculation chillers in his lab. By holding only 2 to 3 gallons of water at a time, the chillers dramatically reduce both water use and flood risk. “If water were to spill into the lab in a six-hour period, a maximum of two to three gallons would be lost,” Moore said about the chillers. Compare that with the 237 gallons of water lost in a flood by a single-pass cooling system. While installing these chillers already exceeds green certification standards, Moore’s water conservation efforts do not stop there. Water aspirators are commonly used in laboratories to create vacuums by cycling water through a nozzle. Instead of wasting the two gallons of water per minute necessary to run the aspirators, Moore opts to use PTFE-lined vacuum pumps instead. In a six-hour period, typical water aspiration requires around 720 gallons of water. Moore’s PTFE-lined vacuum pumps use zero. By using no water at all, the vacuum pumps also decrease risk of ground water contamination, as fluid or solvent vapors cannot pass through the pump via water flow. In addition to water, Moore’s safety program is designed to optimize the use of organic solvents — carbon-based substances that dissolve or disperse in other substances. One challenge was to figure out how to purify the solvents, a vital step in his chemical syntheses, while avoiding the safety hazards of typical purification techniques. Traditional thermal distillation systems, for example, are prone to igniting the flammable solvents. As a safer, more sustainable alternative, Moore has installed three VAC sieve column solvent purification systems in his lab. These columns waste less of the organic solvents, and they also create an air-free space that reduces risk of ignition or explosion. As with all of Moore’s equipment, the goal is to create a safer work environment while reducing impacts to the environment outside. “Lab safety is really only effective when it is incorporated into the culture of an organization,” said Moore, who was recognized at the 2018 University Laboratory Safety Awards ceremony. At the outset of the ceremony, Sethuraman Panchanathan, chief research and innovation officer and executive vice president of ASU’s Knowledge Enterprise Development, delivered remarks to the assembled guests. Lauding the efforts of researchers and staff to improve safety practices and promote safety culture, he stressed the importance of recognizing such work. “This award reflects what we stand for as an institution — advancing knowledge, scholarly work and research in an environment that’s safe for our staff, students and faculty,” Panchanathan said. Safety program: Implemented a safety orientation for new staff members, a system of creative safety signage at point-of-use locations, a dynamic gated chemical ordering process and a reagent labelling system. Safety program: Developed a comprehensive system promoting Hepatitis B vaccination for all laboratory personnel. Safety program: Incorporated Quartzy, a free lab management platform, to streamline chemical requests and inventory management. Safety program: Incorporated a checklist of skills into safety training for undergraduate and graduate researchers, provided personally by Chen and his senior students. Gary Moore is also a researcher in The Biodesign Institute Center for Applied Structural Discovery, a senior sustainability scientist for ASU’s Julie Anne Wrigley Global Institute for Sustainability, and guest faculty at Berkeley Lab. 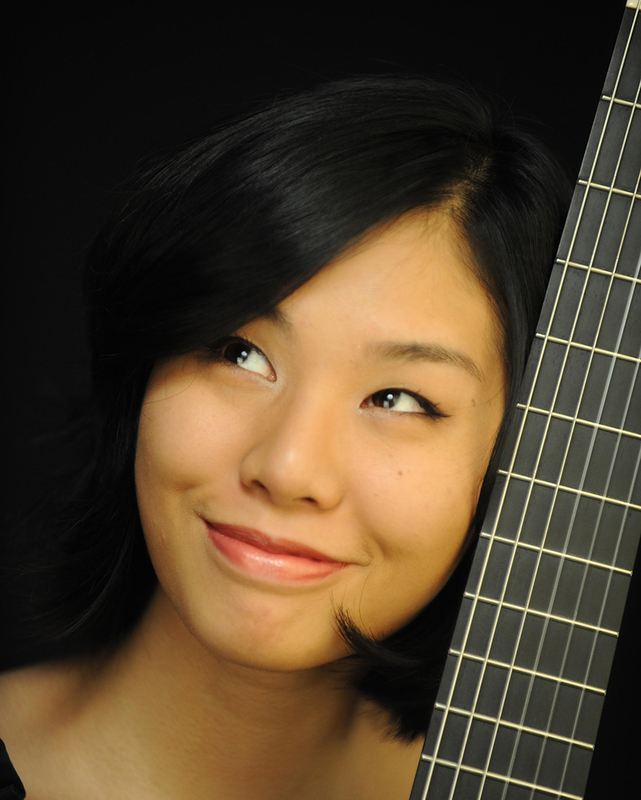 The School of Music in Arizona State University's Herberger Institute for Design and the Arts welcomes Jiyeon “Jiji” Kim as assistant professor of guitar in the strings program, beginning in August 2018. Kim, a self-described adventurous artist who is known professionally on both acoustic and electric guitar as “Jiji,” plays an extensive range of music, from traditional and contemporary classical music to free improvisation. Her musicianship, stage presence and repertoire earned her first prize at the 2016 Concert Artists Guild International Competition. Inspired by her teachers and mentors from Korea to Yale, Kim said she developed a love for teaching and passing down a rich legacy of pedagogy to the next generation. She credits her educational institutions for helping her explore nontraditional experiences as a guitarist and learning what it means to be a musician in the 21st century. She said it is important that her students understand the necessity of entrepreneurship. Kim holds bachelor’s degrees in guitar performance from the National University of Arts in Korea, the Cleveland Institute of Music and the Curtis Institute of Music; and a Master of Music degree from the Yale School of Music. Her chamber music performances include One Beat Project, Wild Up, Eighth Blackbird, Argus Quartet and the Tanglewood Music Festival, and she has been featured on PBS, NPR’s "From the Top" and Hong Kong RTHK’s "The Works." Her solo recitals and featured soloist performances include Carnegie Hall, National Sawdust, Mass MOCA, the 92nd St. Y’s 10th annual Guitar Festival, Lincoln Center, United Nations, Virginia Arts Festival, Princeton Sound Kitchen, Metropolitan Museum of Art, Philadelphia Museum of Art; and she has performed with the Kansas City Symphony, the Great Falls Symphony and the Roswell Symphony. A passionate advocate for commissioning and performing contemporary works, she premiered “Talking Guitars” by renowned composer Paul Lansky, with a subsequent studio recording with Chinese guitarist Hao Yang to be released on Bridge Records. She previously premiered works by emerging composers including Gabriella Smith, Riho Maimets, Krists Auznieks, Gulli Björnsson, Andrew McIntosh, and Farnood Haghani Pour. As a 2017 BMI Foundation award recipient, she commissioned Nina C. Young for a new guitar piece to premiere in 2018. In addition, the New York Youth Symphony and the American Composers Orchestra commissioned two concertos for her, both premiering at Carnegie Hall in the 2018–19 concert season.